"Go and sell everything you own and follow me." 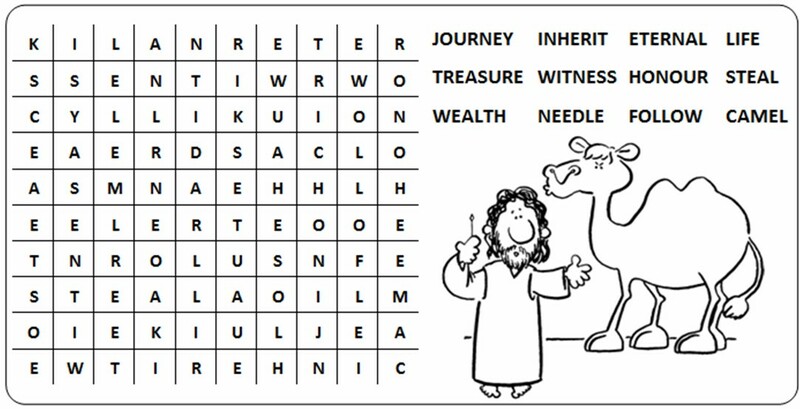 In today's story of the rich young man, who comes to Jesus full of good intentions, there are some simple words that speak so clearly to our own age: when Jesus tells him to sell every­thing and give it to the poor, his face fell at these words, and he went away sad, for he was a man of great wealth." How sad it is that such a keen (he runs up to Jesus), and by all accounts good young man (whom Jesus loves) could not free himself from the one thing that was holding him back  his dependence on money. Jesus words How hard it is... perhaps indicate his own sadness that the young man could not free himself from this. Jesus teaching was new ‑ as the disciples reaction shows. In Israel at the time, riches were thought to be a blessing from God. But as Jesus knew and taught, holding on to anything that passes away can distract us from holding on to things that are eternal. This is an intensely reflective love poem ‑ not love of another person, but of Divine Wisdom. Even so, it still uses the language of human love to express the de­votion of the just person to God's way of looking at this life. Since this is such a deep poem, and so personal, it must be read in a different way from a story or exhortation: notice how of­ten the first person I is used: this is a reading that calls for quiet concentration. When you arrive at the lectern, allow the shuffling as people sit down to die fully away before you begin this meditation. Take it slowly and quietly (while making sure you are heard!). Use the colour of the phrases more than sceptres or thrones, pinch of sand, ranks as mud, radiance never sleeps and so on. Ask yourself Why this word, here?" in order to find the full ex­pressiveness of the poetry. And, as always with poetry, see the words as pictures and images, unfolding them in your mind, so that they can be read with their full inten­sity. This passage from the letter to the Hebrews is very straightforward ‑ almost abrupt. The author uses very short phrases, in order to underline and emphasise the message: Gods word, voice or message is immensely powerful, and cannot be avoided. It is a word which judges us, our actions and our thoughts. Be aware of the short phrases in this reading, and offer them, one by one, to your listeners, allowing each one to sink in. Dont be afraid of losing the flow of the reading  its tone is very deliberate, and demands the careful delivery of each idea. However you read, be careful to em­phasis the first four words: The word of God... everything else in the reading refers back to this, and if people have missed it, then the whole will be lost.